When we think of retro kitchens, bright, vibrant colours often spring to mind. Whether you want to be bold and paint your walls a tangy orange or a zingy mustard colour, or be more subtle and add a splash of colour to your kitchen with coloured cabinetry. Alternatively, if you want to go down an even more subtle route, place some coloured appliances in your kitchen to add a touch of retro design without being too garish. When we think of retro kitchens, bright, vibrant colours often spring to mind. There are a variety of appliances, such as refrigerators, mixers, kettles, ovens, and so on that are available in vibrant, statement colours that can give your kitchen a retro atmosphere without going completely mad on the design front. 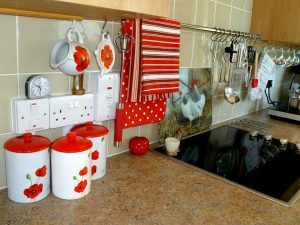 Coloured appliances are a great choice for adding a statement showcase piece to your kitchen and adding your own personal stamp. If you don’t want to drastically change the look of your kitchen but want to give it a more retro atmosphere, then adding a few retro signs here and there can go a long way. Vintage signs are great for putting your own stamp on your kitchen and making your room unique to your tastes, as well as adding some nostalgia to your kitchen, making you feel as though you’ve jumped back in time. Dark woods are also a prominent feature that were very popular back in the day, which is why our wenge worktops are the perfect addition to any retro style kitchen. Wenge worktops are a glamorous, high-class addition to any kitchen design, and will beautifully complement your choice of vintage kitchen design whilst also adding a date, vintage feel to the look of your room. Wenge worktops are a glamorous, high-class addition to any kitchen design, and will beautifully complement your choice of vintage kitchen design. When choosing vintage style flooring for your kitchen, we suggest a traditional black and white checkerboard pattern, geometrical patterns or wood effect vinyl floorboards. Vintage flooring is great for adding a retro statement to your kitchen and allowing it to burst with colour and character, making it the perfect talking point. Lighting is key to any room design, but with retro style kitchens it is essential, especially if you’ve gone for colour schemes that can darken the look of your room. Adequate lighting can enhance the look of your design and add to the overarching theme of your kitchen, whether it be through using pendant lights, free-standing lights, in-built spotlight, and so on.